A memorable choice for any special occasion. 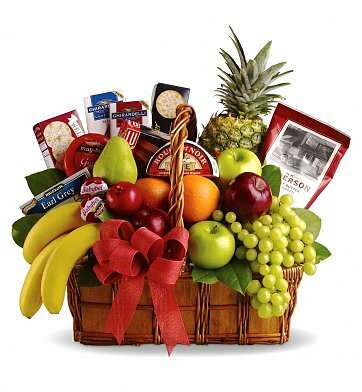 Given special care and hand-selected by experienced florists in the recipient's area, this basket may include fresh fruit such as red and green apples, bananas, or grapes. Gourmet items may include cheeses, crackers, chocolate, or cookies. Each basket is a one-of-a-kind creation. Pictured fruits, gourmet foods, and specific container will change due to seasonal availabilities or designer's preference. Bon Vivant Gourmet Basket is a hand delivered gift. These gifts are delivered by one of our local design centers located throughout the United States and Canada. Same day delivery is available for most gifts when ordered before the cutoff time. The cutoff time for Bon Vivant Gourmet Basket is 1 PM in the recipient's time zone. Great Christmas Gift for clients! We send these to our clients every year. They love these baskets because all the people who don't eat sweets can still enjoy them! Thank you very much for the lovely Gift and on time delivery. It was great to send loved once special gift like that. I need to thank Stephanie, one of your most helpful and cooperative reps. I spoke to her on the phone and she was so very helpful. We were trying to order a basket with a couple of bottles of wine but much to my disappointment but through no fault of yours, liquor of no kind could be shipped into PA. Even though it was a disappointment; Stephanie did everything in her power to make the basket fantastic.....and that she did!!!! This was the first time I used Gift Tree; but believe me, it won't be the last. Thank you once again for the awesome job you did. The recipients of the basket went on and on about the abundance of items in it and how very delicious everything was. So once again, thank you Stephanie, for all your help. And I will definitely be using the Gift Tree again. Fantastic gift basket! Parents 50th wedding anniversary. I called and they delivered the same afternoon. They were helpful over the phone, helping pick the best arrangement for the anniversary. I will order again. I highly recommend this company over others, great products, speedy delivery and awesome service. Thank you for your effort, but The baskets that I received were a little different with the basket which is showed in the screen. Hope would be better in future. I had used your service once before, a number of years ago, and that recipient said the basket was very, very nice. This current purchase was sent out of state, and I have not yet heard back from the recipient, sorry. I would like to say the the personnel I worked with at your business, were very knowledgeable about the products, and extremely helpful. I had initially given the incorrect street number for delivery. I called to notify you, and it was immediately corrected, and I do know that the basket got to the correct destination on the requested date. Very helpful people you have there. Thank you, I would use you service again. We sent this basket to my father for a birthday gift. I called this order in on over phone and a very helpful customer service agent helped customize the order. The order was delivered on time and my dad was impressed with the quality and variety of the basket. Recipient says the basket was wonderful - the fruit was fresh and all items I custom-ordered were included. The only thing I was displeased with was that they did not deliver but made the grieving family come pick it up. I was told it would be delivered to the funeral home. Recipient was not complaining, she said it wasn't far, but I was not happy they had to deal with picking this up when they were busy planning a funeral.